I have recently learnt about gall wasps (Andricus quercuscalicis) and Knopper galls, and now I’m becoming obsessed with galls. Basically, a gall is like a nest, or development nursery, for an insect or bacteria or whatever, and they grow on anything. The ones that I noticed were on the oaks around Horley. Essentially, the wasp lays eggs inside growing acorns, and as the grubs grow, they distort the acorn into a weird, sticky thing, like an unshelled walnut without the symmetry. Then the Knopper gall goes brown and falls with the rest of the acorns, ready for a wasp to emerge in Spring. 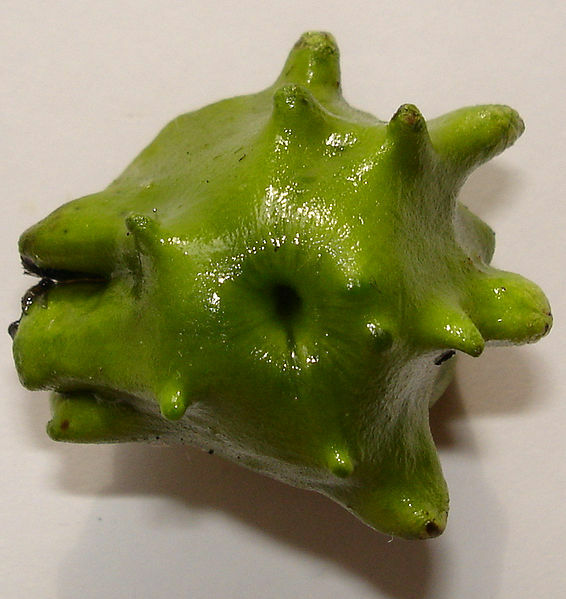 I know it’s nature, but it freaks me out, especially as Elle and I had collected a few Knopper galls in our pockets. The thought makes me shudder, and I keep imagining some dreadful moment when grubs spill forth from our clothing, like maggots from a dead blackbird. It would probably be at the school bus stop, and none of the children’s little buddies would be allowed to come and play again. Anyway, at first it seemed only the little oaks were effected, the ones in Emma’s Bottom Meadow, but then we found them on one of Dave’s huge oaks in the field beneath the cricket pitch. It’s not all of the acorns, there are scores of beautiful golden ones, but every few feet, you find a Knopper. 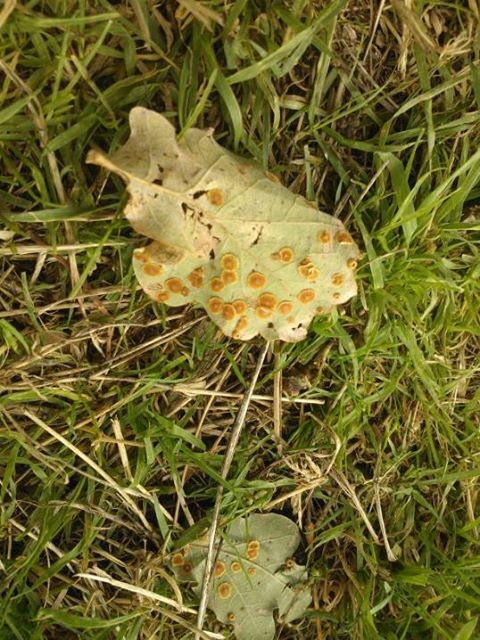 Learning about the Knopper Galls, I also found out about spangle gall, which is what’s on the oak leaf below. I always asumed it was some sort of weird mould, but apparently not. It’s – Neuroterus quercusbaccarum, according to Wikipedia – another type of wasp. Neither types of wasp appear to harm the tree long term, but I wish I could understand more – what do the wasps do, for example? Are they food for birds? If anyone knows how I could learn more – do say, I hate being so ignorant. Fascinating stuff, even if it makes my skin crawl. Definitely share your view on these! Funnily, was looking at wasps in the Natural History Museum today. Hard to catch a lot of the info as 4 yr olds were climbing all over it, but from what I could gather, most wasps’ purpose in life is to build, feed, and generally pamper the queen wasp, until she goes into hibernation in autumn. When she starts preparing to hibernate, her workers go a frenzied, unsupervised binge to celebrate their freedom, ruining all human attempts to eat outside in autumn. Post-binge, the workers die. No mention of what happens to their bodies. Suspicious? Come the following spring, the queen wakes up, to find a doting army of newly emerged former grubs to wait on her, and the cycle goes on. Does that agree with your wasp knowledge? Do you know what becomes of the bodies? I’d love to know more too…why is there never a wasp expert around when you need one?